We are concerned about these reports. As a general principle, we believe that maintaining the Internet as a neutral platform means that carriers shouldn't be able to interfere with Web content without users' permission. We are in the process of contacting the relevant parties to bring this to a quick resolution. According to one of my blog readers, the Rogers content substitution approach is back. 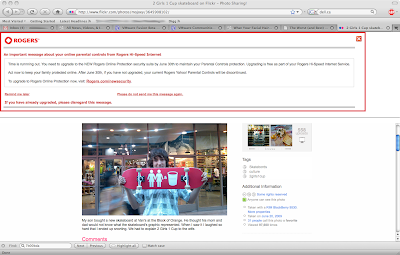 The image below shows Rogers warning a customer about the expiry of some parental controls. The warning is included in a Flickr page. This approach again raises concerns about Rogers interfering with the delivery of content without permission of the end user. When combined with its ongoing policy of redirecting web pages that do not resolve to a company-sponsored paid search page, Rogers own content seems to show up unasked on a regular basis. Rogers also advertises on bit torrent related sites. 1. Throttle Bit torrent as its competition to the rogers rental store and other soon to be announced services. 2. Advertise on bit torrent to get the savvy clients. I got a bandwidth cap alert once during what was an SSL session with my bank. I complained to Rogers, and they denied even being able to do such a thing. Left them and went to a net neutral company one month later. Unacceptable business practise seem to be the norm for them. @Kevin: Rogers does this when you get close to your download limit for the month as well (where “close” seems to be “within 15gb”) which is *not* something I’ve signed up for. I’m not sure why they couldn’t just let me know with an email. I wasn’t aware that they’d ever *stopped* doing this since they started, so I’m not sure about the “Again Injects” part of the title. I left Rogers for TekSavvy precisely because of this behaviour. Their belief that because they deliver access to the net means they own and control the content is something which should not just be discouraged but regulated against. The marketing weasels at corporations like Rogers will not stop these practices if they believe they can continue to insinuate and deploy them on a incremental basis that minimizes public outcry. Supporting the NDP, Liberal and (one hopes, eventually) Conservative efforts to ensure Net Neutrality is paramount in the face of such actions. Deep Packet Inspection, selective bandwidth throttling, application of targeted non-requested intrusive content are just the tip of the iceberg. Our ability to see, hear and speak freely needs to be protected as a basic right not just in the real world but also in cyberspace. It would do us all well to revisit John Perry Barlow’s brief but exceptionally well-written Declaration Of Independence Of Cyberspace – since it was first posted in 1996 it has never been so relevant as it is today. We should also do whatever we can to use the CRTYC like a big spiked club and whack Rogers repeatedly between the legs until they STFU and get the message: you don’t own the net and we don’t want to hear anymore of your crap, thank you very much. @Trevor I’m with you. I changed my DNS servers to opendns.org. I don’t think it will prevent injection but it should prevent re-direction. This is nothing new at all.. They havn’t stopped, they had just tailored the injections to suit their needs. Once a month I get one of these injections (For the past year and then some) regarding my bandwidth consumption. This is just them expanding upon this. They still should be brought to task for this though. I got one of those injected messages when they upgraded my connection (as did many of my co-workers).. I meant to call their Customer Disservice line and give them an earful and completely forgot. I wonder if I could get away with doing it so far after the fact.. as long as I bring up their “helpful” search page in the process? This is just an “advertising” variant of what they already do for bandwidth consumption notifications. There’s no content “substitution”, it’s a pure “injection”. The DPI box intercepts the first packet back from an HTTP request, modifies the packet to create an injection packet, adds an additional packet and then sends the new mess to the user. The injection doesn’t actually convey the data injection, it creates another request to load whatever Rogers wants into the box. So, that way, even attempts to do an adblock don’t work. Attempts to bypass it by blocking the IP of the load causes the page to hang, because it’s an interactive request, not a simple page load. They really want to make sure you’ve seen it. I have received many calls on this from clients that don’t use Rogers Security thinking that Rogers has detected some sort of virus on their computer. They have called Rogers to find out they are trying to “up sell” services. Glad I didn’t switch over to Rogers! There is an ISP in the states redirecting port 53 (DNS). It’s just a matter of time before Bell, Rogers, videotron, and telus redirect/intercept port 53 back to their own. Don’t count on open DNS being full-proof and a way to by pass the Telco’s DNS for long. I predict 2010 they will intercept port 53. 2. CONSENT TO DATA AND INFORMATION GATHERING. You acknowledge, agree and consent to the following: (i) the Software, in its default configuration, does not block ads from third parties or the ISP, and may not identify as spyware certain websites and applications from RADIALPOINT, the ISP or their business partners; (ii) RADIALPOINT has the right and does access the Software and/or your CPU for various purposes, including purposes related to this Agreement (e.g. including for the implementation of Updates) as well as to download, install and/or gather, obtain, collect and then use, for its business as well as the business of the ISP and/or its business partners, various information and data, including unique identifying, personal and other information such as, without limitation: the identity of a user’s PC, the identity of the operating system, any relevant RADIALPOINT and/or ISP user/subscriber and other IDs, the versions of various Software downloaded and/or installed, other RADIALPOINT and/or ISP unique identifiers to allow targeted notifications, the status as to whether a user checked or unchecked the “Show security alerts” and other options, usage information in relation to the Software and End User Services, information as to which campaigns have been viewed and when and which links a user clicked on as a result of a campaign/notification, information as to when a user asked Software to download and/or install Software; and (iii) RADIALPOINT may share this information with third parties, and may also use such information to target advertisements about RADIALPOINT’s, the ISP’s and/or its business partners’ products and services and to send Licensee e-mails or messages. 3. NO SERVICES INCLUDED. No End User Services, and no maintenance, technical support or other services are provided to You under this Agreement. Any such services are subject to the execution of a separate written agreement on commercial terms. We have no obligation to provide any Updates to You. Any Updates so provided to you under this Agreement in RADIALPOINT’s discretion will thereafter be part of the Software and governed by this Agreement. Now pick that apart and your eyeballs should pop-out. a) (i) English: Spyware, ads, and popups from our partners won’t be caught using our security software from companies/partners that we have a relationship with. b) (ii) English: We can access your computer any time we want (aside from updates) to install stuff or gather info from you and your computer, and about you(like whats installed or what you have on it or what you downloaded, what link you clicked on etc..) . This right includes our partners whom you may have no relation with. C) (iii) English: We can give away all the data we collected on you (as per A & B) and give it away to any of our partners. This is so we can directly target you with ads based on what our security spyware found out about you. We will also send you spam via Email (since we collected you info such as Email address). D) 3. “No services included”… English: Don’t expect support for this. We may even decide not to update it. But we will sure as hell grab all the info off your computer and send it back to us. You agreed to understand the terms and install it. It may or may not work. Wait for it… 2010 will be the year of tracking your every move (open DNS? heh wait till they take control of port 53). This is why Mr. Moore is excited. Think of all the marketing opportunities! It’s exciting. This is also why the Canadian Marketing Association is against that anti-spam Act (Bell et al. are all members of the CMA. The same group who told their members not to use Dr. Geist’s iOptout). I expect a lot of fun in the coming months. TOS’s like the above should be outlawed. Period. How many people do you think realize that the security software they got from Bell or Rogers for “free” is actually spyware? How many do you think even understand? The web-injections & port 53 interceptions will be an integral part of your security. Accept it. Bell gives this for free. Rogers gives this for free. Videotron actually charges you to put this spyware on. Dunno about Telus. I recently left Rogers for both Home phone and Internet services over these issues. I made it very clear to them why I was leaving (in a civil fashion of course) and also made it clear that I was switching to Teksavvy because they proudly advertise that they believe in and fight for Net Neutrality. For me, it wasn’t just a moral victory either: My bill is about $20 less a month, I have a much higher monthly cap, and the phone support is fantastic. It’s just a shame that you have to be really into this stuff to even know that Rogers is doing anything wrong. I also hate how Roger’s directs you to http://www20.search.rogers.com/search? on a nonexistent domain. Just send me to a proper 404 page ya bastards. I don’t want to see you ad’s. I know you can click to get it to stop. But once you delete the cookie it goes right back to doing it. So they are indeed openly spamming people via web-injection to actually install the “free” spyware shown above! wow. I find it amazing. I hope those suckers (lack of a better word) that fall for this know that Rogers is spamming them to install spyware. It’s not “just delivery of content” when you take into account the spyware that “sends” everything on your computer to them and shared with their “partners”. that these ads aren’t counted against your bandwidth cap… I somehow suspect that they are. I’ve had that stupid box injected into my browser on two occasions now. Not only do I hate them interfering in that way, but the information on it seems to be wrong. I cannot find the links they refer to. And it annoys the hell out of me when Rogers redirects me to their paid search page. AND their traffic shaping is getting worse. When it comes to company acting like a monopoly and treating its customers like dirt, Rogers is the new Bell. I was going to switch to Teksavvy a year ago, but a friend told me I’d be worse off, because even though Teksavvy advertises a much higher cap, Bell would still be able to switch me off when I reached Bell’s idea of a bandwidth cap. I’m afraid I’ve been horribly gullible again, but I have a brand new DSL modem sitting right here, and I cancelled Rogers useless phone service. Seems I could switch both to Teksavvy. What are other opinions on this? @annoyed Rogers victim: head over to dslreports, where Teksavvy CEO and other regulars can help you. You don’t get Bell or Rogers CEO in an Internet forum. I’ve always wondered why those megacorporations are not keen to venture outside of Canada to expand their business. The answer is obvious: they can do whatever they want in Canada and act monopolistic whenever they want to. There’s no need to compete in the REAL world for profits when you have unlimited power at home. Rogers is a fine example of that. “I got a bandwidth cap alert once during what was an SSL session with my bank. This is a technical problem that has technical solutions, which involves filtering at the browser level, or simply use low grade encryption. The time for clear communication is nearing an end. Put that extra core in your CPU to good use. The telco cartels may control the networks, but we will control our machines. I liked that they were notifying me of useful information, that I clicked once to turn off and didn’t have it come on again… Find something real to complain about you nannies..
My BIGGEST issue with the 404 redirects is other than the fact that it in violation of net neutrality, it is also inconvenient. Hey, let’s start by banning those annoying little animated logos at the bottom of your TV screen. And bills…. Hey, they’re nothing but annoying. Let’s forbid the cable company from billing us, and then we can’t be expected to pay! Come to think of it, let’s ban all telecommunications. Or maybe even all technology! I left Rogers for Primus. As Primus now runs its own backbone network with links into the DSLAM’s located in Bell’s local exchanges, Bell can’t touch their network at all. I get max throughput any time and all the time. And no HTML hacking, yes hacking as Rogers rips the web stream apart to inject the common nonsense, at all!!! Primus also has REAL live Canadian people answering the phones with great customer service. I’ve been with them for 5 months now and I am glad I left TED. Oh wait TED is no more!!!! I switched to Teksavvy about a year and a half ago. I have had little problem until recently. My speed was cut in half. (they claimed Bells fault) Bell came out and did something which increase my speed to about half of what it should be. I called Teksavvy and they increased it to what it should be. Now it’s about half again (two weeks later). I called their 24/7 tek support. THEY DON’T HAVE 24/7 TECH SUPPORT! EVEN THOUGH THEY ADVERTISE IT EVERYWHERE ON THEIR SITE!. IT’S ONLY WHEN YOU CALL AND WAIT AND WAIT AND WAIT. THEN HANG UP AND CALL AGAIN AND WAIT AND WAIT AND WAIT UNTIL YOU HAVE TO LEAVE A VOICE MAIL. AS SOON AS YOU SEND THAT, YOU GET A MESSAGE THAT SAYS THEY DO NOT HAVE 24/7 TECH SUPPORT. I USED TO BE BEHIND TEKSAVVY 0. NOW I THINK THEY’RE NO BETTER THAN ANY OTHER ONE. FALSE ADVERTISING IS A CRIME! If you want some fast stable DNS servers, use the Version L3’s. They have 8Gb connections and don’t redirect like rogers and opendns.